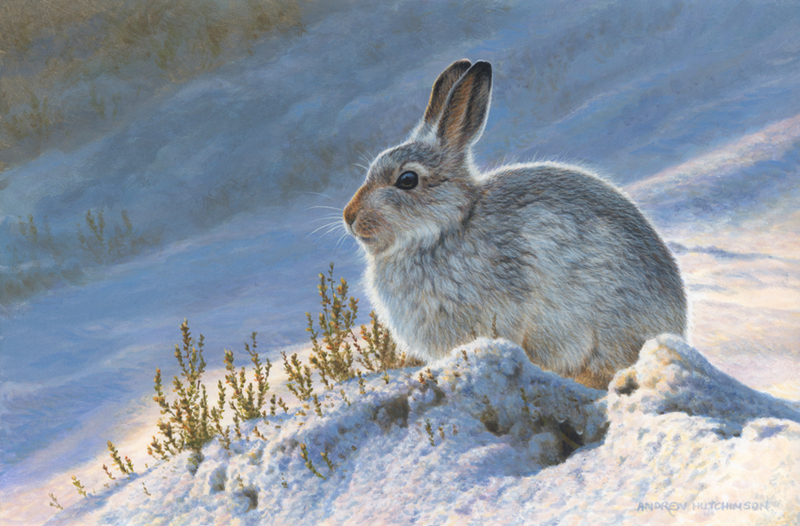 The mountain hare is one of the most widely distributed of the hare species. It is also one of the largest, second only to the European hare. It is highly adapted for the snowy mountainous regions that it inhabits. 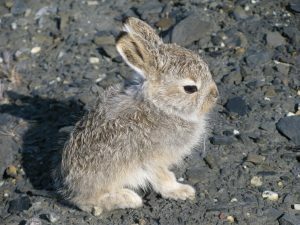 Size 18-26 inches (45-65 cm); tail length is 1.6-3.1 inches (4-8 cm). 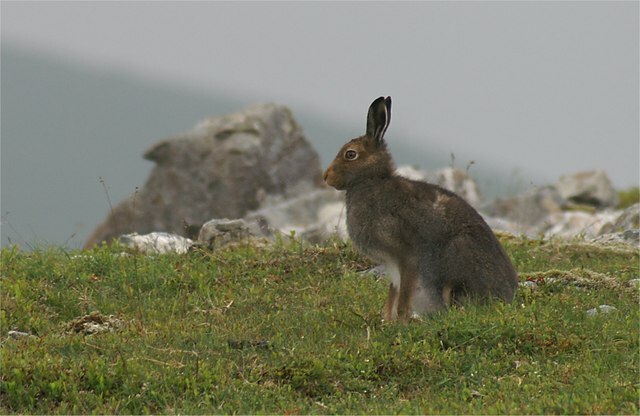 Mountain hares are nocturnal and solitary animals. Despite their solitary nature, they have been known to eat in groups of up to 70 individuals, especially during difficult weather conditions. 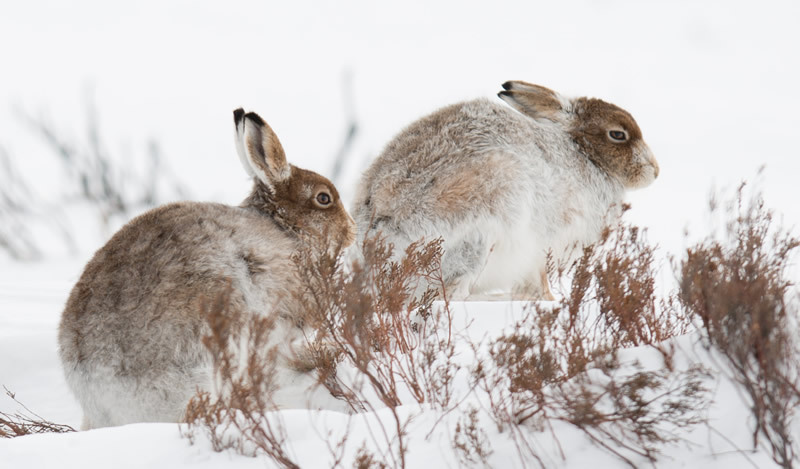 Their home ranges are between 80 to 100 hectares. 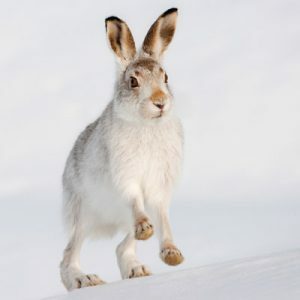 Being saltatorial, their main method of locomotion is through leaping and hopping; a threatened individual can reach speeds of more than 60 km/h whilst hopping away. 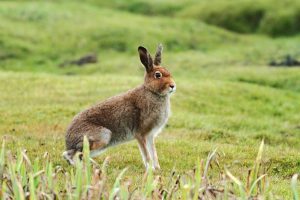 During the breeding season, a female may be pursued by many males, but if the former is not in heat it may drive the suitors away by scratching or showing its back towards them with the ears laid back. A female may have 2-3 litters in a year. 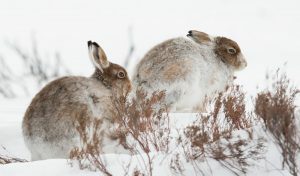 Litter size varies with the size of the mother, and a larger female is capable of having a bigger litter than a smaller-sized female mountain hare. Infants, or leverets, are born with a weight of around 0.20lb (90gm), with fully developed fur and opened eyes. Suckling begins immediately after birth and weaning takes place after a month. 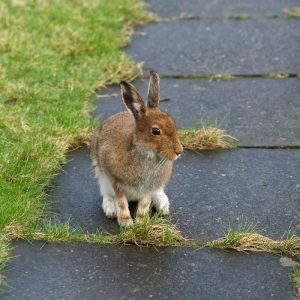 Mothers leave their wards by themselves for most of the time, occasionally returning to the burrows only to feed and suckle her young. 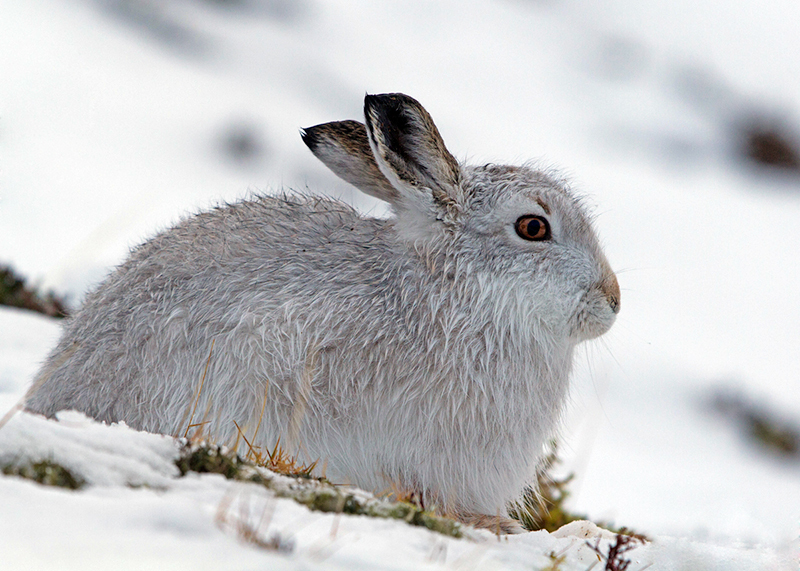 The Arctic hare used to be considered as a subspecies of the mountain hare, but it has now been segregated into a distinct species. There are sometimes fraternal associations between mountain hares, but females do not develop relations with each other. Published on August 26th 2016 by Sudipto Chakrabarti under Coniferous Forest Animals. Article was last reviewed on 24th August 2016.